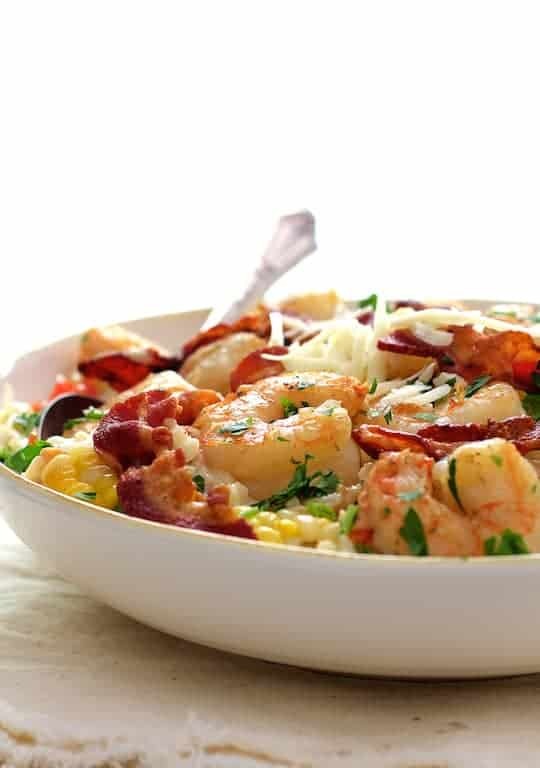 There’s still some summer left to make this summery American-style shrimp and corn risotto! First, how cute are my little mini bacon strips! Love, love, loving these as my new bacon garnish! So much more interesting than just crumbling bacon over the top and they’re crazy simple. 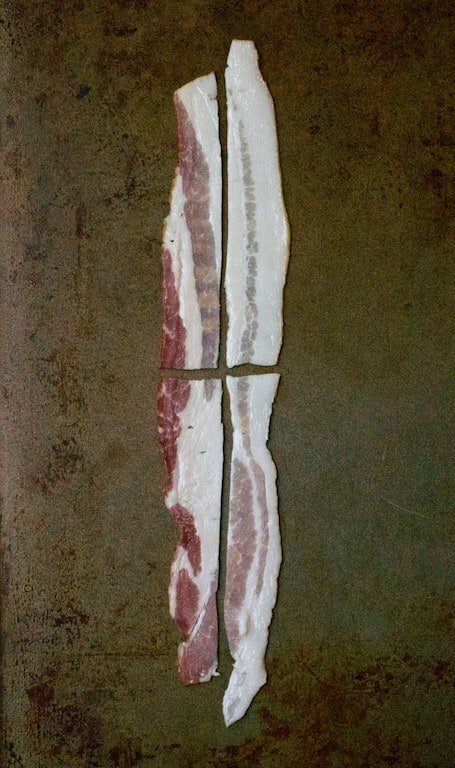 Just cut each slice of bacon lengthwise, then cut in half. That’s it! Then cook in a pan or skillet as you would full-sized strips of bacon. Because they’re smaller, they do cook pretty quickly, so keep an eye on them. Save half of the strips to garnish the risotto and crumble the rest to add to the finished dish. 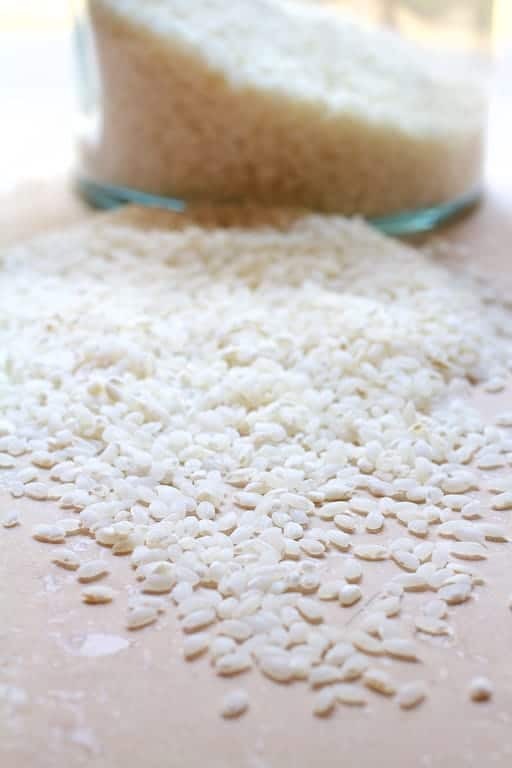 Risotto is generally made with Arborio or Carnaroli rice. Both are short-grain, absorb a fair amount of liquid and turn creamy when cooked. After softening onion, shallot or other aromatics in plenty of fat, the rice gets added and is cooked until slightly translucent. It’s at this point you may want to just relax and perhaps turn on a cooking show on a nearby television because you’ll be at the stove for a while stirring the risotto. If using white wine, it should be warmed–or at the very least room temperature–not cold directly from the refrigerator. The stock should also be heated. Adding cold liquid to the rice will have an adverse effect on the texture and cause it to cook unevenly. After the wine has evaporated, add the broth in increments, stirring slowly and constantly after each addition until it is absorbed. Like pasta, risotto should be cooked to an al dente stage, which means “to the tooth” in Italian. When properly cooked, the kernels should still be somewhat firm. They should be neither soft or crunchy. The required amount of broth to rice is generally 4:1 (four cups broth to one cup of rice). You may need less; you may need more. I used Asiago, but Parmesan or Romano will also work. And don’t forget… Always use wild-caught American shrimp! Risotto can be used as the base for almost any combination of meat, seafood, poultry or vegetables to create a satisfying and comforting main dish any time of year! Season shrimp with salt and black pepper. Add shrimp to bacon drippings and cook 1-2 minutes per side or until pink and firm. Transfer to the plate with the bacon. Wipe out pan. Stir in the garlic and rice and cook 1-2 minutes, stirring slowly but constantly, until the rice is slightly translucent, being careful not to brown it. 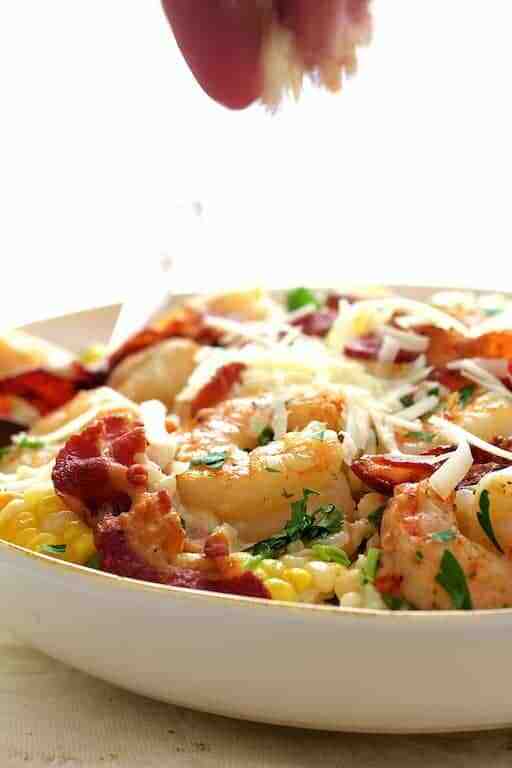 Stir in the crumbled bacon, shrimp, corn kernels, heavy cream, cayenne pepper, cheese and parsley. Heat through. Adjust seasoning with salt and black pepper to taste. Garnish with bacon strips. Serve immediately with more grated cheese if desired. Has anyone added zucchini to the onion/bell pepper mixture? I would like to add more vegetables but I am afraid the zucchini will get too soft while the risotto is cooking for the 18-20 minutes. Thoughts? Hi, Erica, Hopefully, someone will see your question and comment if they did. I also think the zucchini would get too soft unless you quickly sauteed it in the pan/pot you plan to use, transfer it to a plate then add it in near the end. Thanks so much! Hope you’ll give a try and let me know how it goes. Hi! Is this 935 calories per serving or for the whole thing? Hi, Emily, Thank you for your question. So sorry, but I’m not sure where the 935 is coming from. I ran the recipe through a different program and the calorie count was more like 650. The only way to get a really accurate nutritional analysis is to do it item by item. If calories are a concern, I would recommend using the Self [Magazine] Nutrition Data: http://nutritiondata.self.com/ Thanks again and hope that helps. Can you make this dish in advance and hold it in the warming draw? Hi, Randi, Thanks so much for your question. The thing about risotto made with arborio rice is it overcooks very quickly. If you want to make it ahead, I would suggest doing what a lot of restaurants do. Get a sheet pan super chilled by placing it in the freezer. Then, make the risotto as directed and when the rice is still very “al dente” (still has a lot of “tooth” to it–more than you’d like), transfer it to the chilled sheet pan and cook it down as quickly as you can. When the risotto is not steaming anymore (you don’t want to ruin your freezer or melt the other things in it), pop it back into the freezer to continue chilling down. (Don’t freeze though.) Then move it to a container and refrigerate. Then, when you’re ready to serve, add additional chicken broth and heat it through. I would also wait until it’s heated through to cook and add the shrimp so the shrimp doesn’t overcook. Hope this works for you! Let me know how it goes! I’m making a variation of this tonight with shrimp and scallops, and tomato instead of bell pepper bc it what’s in the fridge. I can’t wait to eat!! 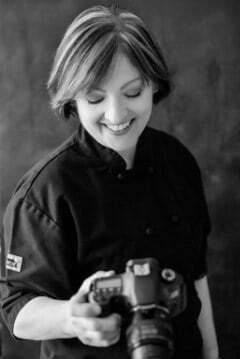 Hi, Nathalia, Love that you’re making the recipe your own by using what’s in your fridge. I do that all the time! Hope you enjoy! Ive made this a couple of times now and it has become one of our favorite risotto recipes. Next time I might kick it up a notch by adding some fresh sea scallops. Great recipe…thanks! Thanks, Gerri! 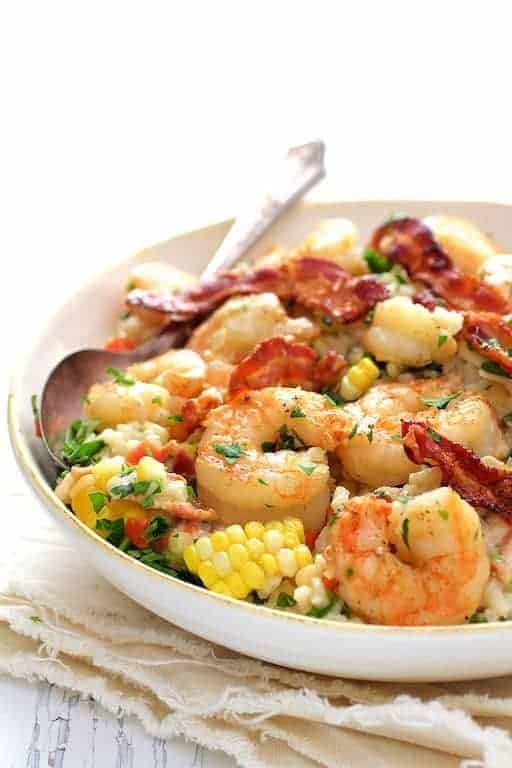 Scallops with shrimp or instead of the shrimp is an amazing idea! So glad you are enjoying and please stay in touch! Thanks, Lara! Hope you enjoy! I’m just wondering how much the recipe would be altered if Jasmine rice was used, if that’s even a possibility. Hi, Dionne, Not so sure on that. Jasmine and basmati rice have such a distinct flavor. I’d stick with something neutral like arborio or even plain white rice. If you try it with jasmine rice, let me know how it turns out. Thanks so much! I made this for dinner tonight. AMAZING! I did fry my shrimp in bacon fat. Also used some bacon fat in sautéing the onion and pepper. By far my fav on Pinterest. Will be making and sharing the recipe with others. Thanks so much, Mary Ann! Love that you cooked the shrimp, etc. in the bacon fat. I’m always a wee bit afraid to suggest that! Please stay in touch and I sincerely appreciate the shares! It’s great to read comments when people actually have made the recipe. Yes all the photos look great! But, I want to know how it tastes and if any alterations were made. Again, your recipe was a true winner. I share often. Thanks again. Hi, Mary Ann, Thank you so much for your kind words. So glad you enjoyed, I sincerely appreciate it and please stay in touch! I just HAD to comment after I yummed. This looks delicious. Just my type of food — you’ve got my Italian blood perking. Can’t wait to try it 🙂 Hope you’re Sunday is going well. 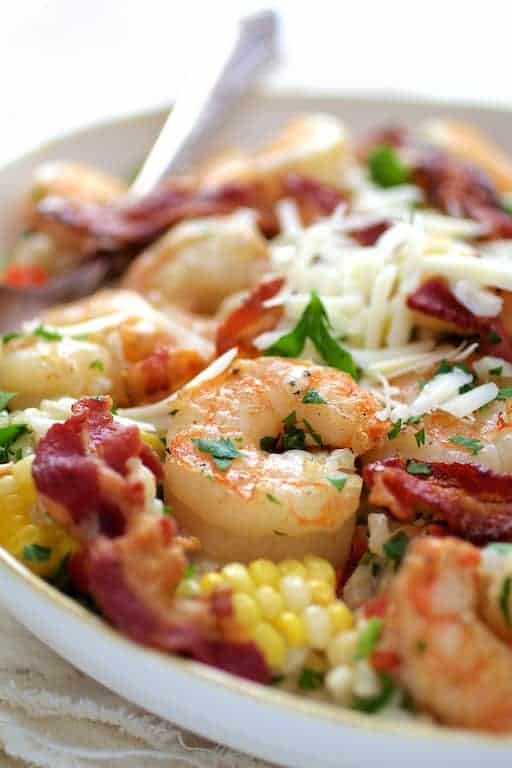 Unfortunately I will never have an opportunity to make this since my husband is allergic to shrimp, but it looks BEAUTIFUL. Hi, Julie, Thanks so much! Chicken would be a great substitute.